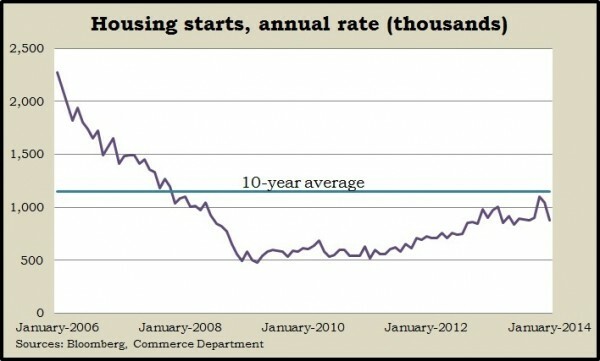 The annualized rate of housing starts dropped 16% in January, sinking to the lowest rate since September but on par with the level in 2008 before the financial collapse. Data from the Commerce Department showed building permits also slowed from the December rate, dropping more than analysts expected. Extraordinary weather conditions probably held back housing in parts of the country. Some economists are counting on housing to keep contributing to U.S. growth in 2014. Inflation at the wholesale level was slightly higher than analysts expected in January. Higher food prices added to the second monthly rise in the Producer Price Index. The Bureau of Labor Statistics reported the year-to-year wholesale inflation rate was 1.2%, suggesting economic growth remained slower than Federal Reserve targets. Employment conditions continued to moderately improve according to the moving four-week average for initial unemployment claims. The Labor Department reported that the average rose for the fourth week in a row, but it has stayed below the long-term level for 13 months, suggesting employers are reluctant to let workers go. The broadest measure of inflation rose slightly in January. The Bureau of Labor Statistics said the Consumer Price Index showed an annual inflation rate of 1.6%. That was the highest since last summer but below the 2% zone targeted by the Federal Reserve and lower than the average rate of 2.9% over the last 30 years. The U.S. economy will continue expanding at least through mid-2014, according to leading economic indicators followed by the Conference Board. January gained less than December, the business research group said, but the smoothed six-month average suggests a “resilient” economy that could pick up pace with more consumer demand and investment spending. Another sign of weather’s impact on housing came from the National Association of Realtors report on existing home sales in January. The annual rate of transactions fell 5.1% – more than analysts expected. Besides protracted weather problems in various regions, the trade group cited “ongoing headwinds of tight credit, limited inventory, higher prices and higher mortgage interest rates” for holding back sales.